I have no idea if this is what this dish is really called. It’s modeled after those yellow chicken curry dishes you can get when you are out at a nice british style pub. I figure it probably comes from that whole british and india connection there. Either way, tasty stuff! It’s a much tamer curry than most but it definitely does the trick when you need just that touch of curry in your day. Like we did yesterday. It was a big rainy mess out there! 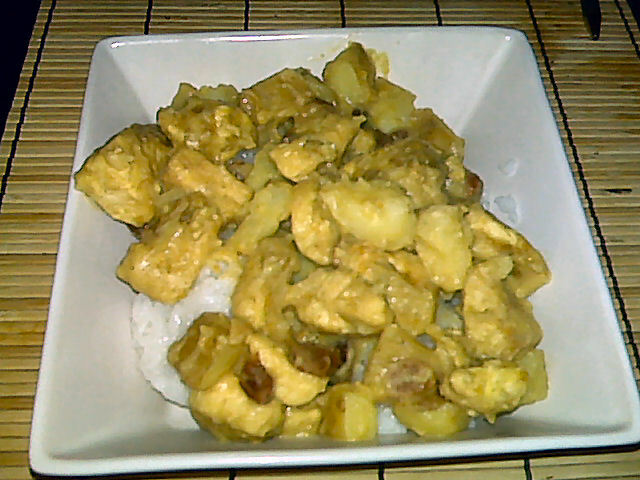 Best solution for rainy spring day, a nice bright yellow curry. Again, we are by no means authentic here. Just tasty and healthy is all. In Ziploc, mix flour, curry powder, garam masala, and salt. Add chicken and shake to coat. Transfer chicken to a hot skillet (reserve remaining flour); sauté until cooked through. Transfer chicken to a bowl and keep warm. Stir the excess flour into the skillet mixing with the pan juices. Gradually add the orange juice and broth, stirring constantly and scraping up browned bits from bottom of the skillet; stir in raisins. Bring to a boil and cook stirring constantly until mixture thickens, about 1 min. Stir in sour cream, potatoes, and chicken and simmer 30 seconds. Serve! This entry was posted in Comfort Foods, Dinner and tagged Chicken. Bookmark the permalink.